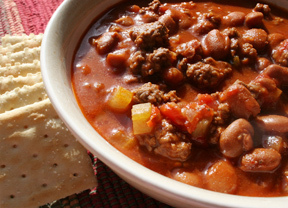 With the help of McCormick® Chili Seasoning, this chili is so quick and easy to prepare that you won't miss any of the big game. 1. Cook ground beef and onion in large skillet on medium-high heat 5 minutes, stirring occasionally. Drain fat. 2. Stir in Seasoning Mix and remaining ingredients. Bring to boil. Reduce heat to low; cover and simmer 10 minutes, stirring occasionally. 3. Serve with shredded cheese, sour cream and chopped onion, if desired. Touchdown Chili Cups: Measure 2 1/2 cups of the chili. Separate 1 can (12 ounces) refrigerated biscuits into 10 biscuits. Press each biscuit into bottom and up sides of greased muffin cup. Spoon about 2 tablespoons chili into each cup. Bake in preheated 400Â°F oven 10 to 15 minutes or until edges of biscuits are golden brown. Garnish with shredded cheese, sour cream or salsa. Touchdown Chili Pizza: Place 1 prepared pizza crust (12-inch) on baking sheet. Spread with 2 1/2 cups of the chili. Sprinkle with 1 cup shredded Cheddar cheese. Bake in preheated 400Â°F oven 10 to 12 minutes or until cheese is melted. Garnish with sliced black olives and chopped green onions.